Choosing jewelry for ashes is not an every day purchase and we understand that you are going to have questions. From what exactly cremation jewelry is to what it holds and what it costs - we've got the answers for you. We have put together our most commonly asked questions so that you don't have to go searching for the information - it's all located in one convenient place! And if you can't find the answers you're looking for - not a problem! Our customer service is standing by and we invite you to contact us with any questions you might have. The Basics - What is cremation jewelry, how much it costs, what it's used for and other standard cremation jewelry need to know's. Filling - How do I fill my cremation jewelry? What goes in my cremation jewelry? How much room is there? Find those answers and more! Maintenance and Care - Find videos, guides and instructions on how best to maintain and care for your jewelry urn! Other FAQ's - For all those commonly asked questions that our customers ask, this is where they are answered. Do you have necklaces for human ashes? Yes we do! Our assortment of necklaces and cremation jewelry is crafted to hold a small amount of human ashes discreetly inside the jewelry, allowing the remembrance to be hidden from the naked eye but still serving as a personal reminder to the deceased. Do you have jewelry made out of human ashes? We do not have jewelry that is made from human ashes. We carry hundreds of different styles of cremation jewelry that was designed to hold a small amount of cremated ashes inside the interior compartment of the keepsake. Styles range from cremation pendants to cremation rings to keychains and more. The urn necklaces are made from a wide assortment of materials and fit every budget. What is an urn necklace? An urn necklace is a specially designed jewelry pendant that includes a chain and can be worn around the neck. Suitable for men, women and children, urn necklaces have a small interior compartment on the interior of the pendant. This interior compartment is typically accessed by removing a threaded screw that is either under the bail or elsewhere on the pendant. The threaded screw protects the inserted ashes and secures them inside the jewelry. Cremation jewelry costs vary depending on the material used and the intricacy of the design. No matter what your budget may be, we have a wide assortment of beautiful keepsakes that will help you to remember your loved one and won't break the bank. Costs can range from under $50 for cremation jewelry that has a base metal of brass or copper or that is made from glass to upwards of over $1000 for cremation jewelry that is made from solid gold and includes such embellishments like diamond or precious gemstone accents. Additionally, extras such as adding an upgraded chain, adding engraved text or expediting shipping can add to the bottom line. For those that have a limited budget, consider glass keepsakes or pendants that have a base metal of brass or copper. Not only are these cremation pendants highly affordable but they also offer the option of adding engraved text to the back where offered or upgrading your chain and keeps the cost around $50. 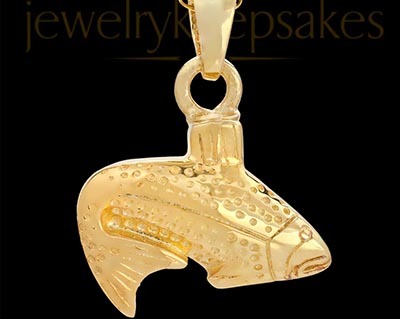 Sterling silver and gold plated cremation jewelry ranges from around $75 - $200 depending on the item selected. Gold plated cremation pendants are 14k gold plated over .925 sterling silver and give the look of gold without the higher price of solid gold. 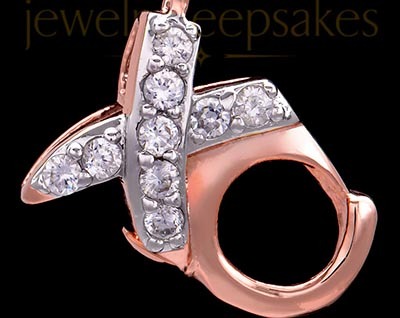 There are hundreds of designs available in both sterling silver and gold plated as well as cremation jewelry that is rose gold plated and priced similar to that of gold plated. Not sure where to start? No problem! We make it easy to shop by price and have a filter that allows you to narrow down your options by budget. Simply go to the left hand side of your screen and find the 'Shop By Price'. This narrows down your options to all cremation jewelry within that particular price point, allowing you to get a broad and complete view of what is available. Can I get the ashes made into a cremation diamond? There are companies that can take the ashes of the deceased and make them into a cremation diamond. That currently is not a service that we offer. Cremation jewelry is made much like that of any type of jewelry. A mold is made of the specific design and the mold is then filled with the selected material such as sterling silver, etc. A small space is left inside the interior of the jewelry to allow for cremated ashes to be added to the jewelry for ashes. Do you have human ashes rings? We do have a beautiful selection of cremation rings and human ashes rings for both men and women! The rings are available in metals such as sterling silver, gold plated and 14k yellow and white gold. In addition to rings, we also have cremation bracelets and keychains that will hold cremated ashes. From cremation rings to cremation keychains to cremation bracelets, we carry them all and so much more! Is jewelry for ashes just for ashes? Jewelry for ashes is NOT just for ashes! Our rule of thumb is that if it is personal to you and your memories of your loved one and it fits inside the small interior compartment then you absolutely can use that as your tribute. A few strands of your loved one’s hair, some sand from their favorite beach, a small piece of the t-shirt they couldn’t live without - if it fits inside the jewelry for ashes then by all means - utilize that as your remembrance! For help with filling cremation jewelry, check out our video that takes you step by step. Additionally, check here for our easy to follow downloadable instructions on how to fill your cremation jewelry selection. What is the thing called you put ashes in? Some call it a vessel, some may call it an interior compartment or a hollowed out interior. There is no technical term for where the ashes are placed inside the cremation jewelry. How much room is inside of my cremation jewelry? The amount of room inside cremation jewelry varies. Some styles such as cylinders and dog tag style jewelry for ashes have a little bit extra room simply due to the way in which they are designed and the shape. Other styles hold a less than normal amount of remembrance or cremated ashes. A good rule of thumb is your standard cremation jewelry will hold about an inch or approximately ⅛ teaspoon of cremated ashes. How do I put ashes in a necklace? It is easy to add your ashes into your cremation necklace. 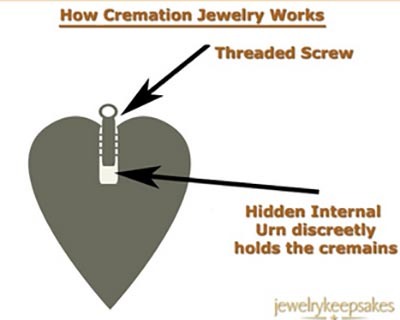 To add the ashes to the interior of your cremation jewelry you must first locate the discreetly placed threaded screw. This may be located by undoing the bail of the pendant or the screw may be on the back side or underside of the jewelry. Remove the screw to expose the interior compartment and using a tapping motion and a small funnel, slowing disperse the ashes into the jewelry cremation jewelry. 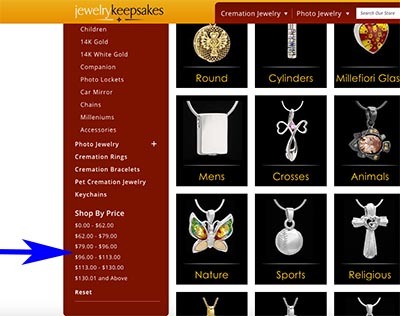 Watch how to add your ashes to your cremation jewelry and/or download our easy to follow filling your cremation jewelry instructions. Do I have to buy special tools to fill my jewelry for ashes? There is no need to go out and buy special tools to fill your cremation jewelry. We include everything needed with your purchase. Your selected pendant or keepsake and matching chain where applicable. An easy to use filling and sealing kit. The kit includes a small funnel specifically designed for cremation jewelry, filling sticks to help push the ashes through the funnel and into the inner cavity and a tube of adhesive. Know what to expect when you open up the box! Is my remembrance secure inside my cremation jewelry? Your remembrance is secured inside your cremation jewelry by the threaded screw. 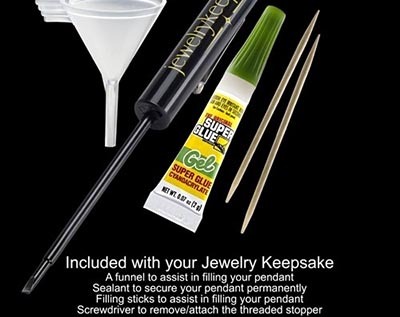 We highly recommend sealing the threaded screw of your cremation jewelry and include adhesive with your order. Simply apply a small amount of the adhesive with a toothpick around the threads of the screw and then immediately insert into the opening and twist tightly to seal. Quickly wipe away an excess adhesive from the body of the pendant. How do I take care of my jewelry for ashes? As with all jewelry, proper care and maintenance of your jewelry for ashes will help to ensure that your selection maintains its beauty for years to come. We suggest you refrain from wearing your jewelry for ashes during rigorous activity and that you remove your jewelry when bathing, showering, swimming or sleeping. Store your cremation jewelry in a jewelry box or velvet lined jewelry bag. A jeweler’s cloth can be used once or twice a month to remove any build-up on the surface of the jewelry and then polished to a brilliant shine. Maintaining and caring for your cremation jewelry - learn about what to do for specific materials! You can also learn more here by reading our downloadable instructions on cremation jewelry care. There is no guarantee that your cremation jewelry is waterproof. Even by adding adhesive and sealing the threaded screw, chemicals found in swimming pools and minerals found in water can potentially harm the integrity of the adhesive. Your cremation jewelry should never be worn while bathing, showering or swimming. Do you carry special cleaner for jewelry for ashes? We do not carry special cleaner for jewelry for ashes and, in fact, advise against using jewelry cleaners to clean cremation jewelry. A jewelers cloth used regularly is all that is needed to keep your jewelry for ashes looking brand new. 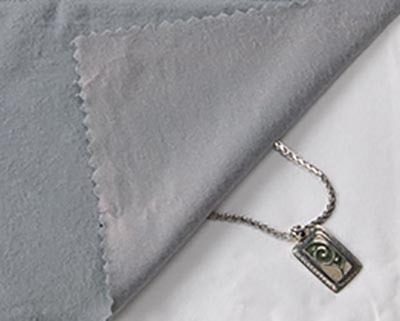 Regular cleaning with a jeweler's cleaning cloth will keep your cremation jewelry looking brand new. Can you put human ashes into jewelry for me? Unfortunately, adding human ashes into jewelry is not a service that we offer our customers. Most funeral homes will add the ashes for you and we also include a set of easy to follow instructions that will assist with adding the ashes into the cremation jewelry. Additionally, we have a video that takes you step by step on how to quickly and efficiently add the ashes into the interior of the cremation jewelry. Click here to find a video on how to fill your cremation jewelry. What kinds of charms for human ashes do you have? We have a great selection of charms for human ashes that are ideal for any member of the family or close friends. Our styles range from heart cremation jewelry to crosses to photo engraved charms that will hold ashes and can be engraved with your favorite picture. We have jewelry for ashes charms that honor our pets, are suitable for children and teens and several styles that have the addition of gemstone accents. Can necklaces that hold human ashes be engraved? Most of our jewelry for ashes can be personalized with engraved text. Do you have a retail store where I can buy jewelry urns for human ashes? 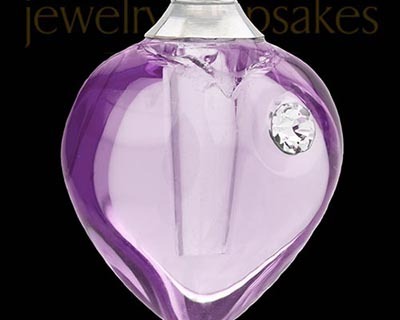 Our online site serves as our retail store for jewelry urns for human ashes. Because there is no associated overhead, we are able to cut out the add-on costs and offer jewelry for ashes at the most competitive prices available online. I want to buy jewelry for ashes but the ashes are currently in an urn. Can cremated ashes be separated? Yes, cremated ashes can be separated from the ashes in the cremation urn. Jewelry for ashes holds such a small amount of cremated ashes and all that is needed is approximately a pinch. The pinch can be taken directly from the urn and placed into the inner cavity of the jewelry for ashes without disturbing the placement of the ashes in the urn. I’m worried about wearing cremation jewelry next to my skin. Are cremation ashes toxic? Cremation ashes are not toxic. Also, because the ashes are confined inside the cremation jewelry, at no point in time do they come into direct contact with your skin.